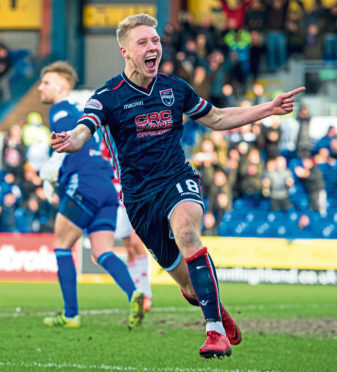 Ross County midfielder Jamie Lindsay is eager to make his third stint in the Championship a short one by helping the Staggies win promotion back to the top-flight. Lindsay opted to join County on a permanent deal earlier this summer, after impressing during a season-long loan from Celtic last year. He netted two goals in 32 appearances, but was unable to prevent the Dingwall club suffering relegation from the Premiership. Having previously spent loan stints in the second-tier with Dumbarton and Morton, Lindsay says the opportunity to challenge for top honours this time around made a return to the Highlands appeal. The 22-year-old said: “We started speaking before last season finished, I obviously didn’t know where we were going to be, but I think regardless of what league we were in I would have been here. “The managers have got a big part to play in me being here. I wasn’t wanting to come back to this league, but it’s a different opportunity this time. “My first loan move was Dumbarton, where I couldn’t get a kick of the ball and was wondering what was happening. “I wasn’t going to influence the game on the ball, so I needed to find a different way to influence the game, but the move was probably the best thing I ever did because I learned the other side of the game which you need. “When I was at Dumbarton and Morton we weren’t going to win the league, but this has a different feel about it. There’s actually a belief and a chance this club can do something this season. “Saturday was a good start, to get that first win away. There’s obviously a long time to go but we just need to get our heads down and work. Lindsay has been encouraged by County’s start to the new campaign, ahead of Saturday’s trip to Dunfermline, and he added: “We have won four games out of five, with four clean sheets. “We have started the season as well as we could have hoped for, really. We had a good pre-season, where we played some tough teams. “We’ve got five games under our belt now, so hopefully we are getting up to sharpness now. Everybody in the group is feeling good. Obviously winning games is helping.